One astronaut, two cosmonauts and 32 live fish left Earth for the International Space Station(ISS) Tuesday morning (Oct. 23), lifting off from a Russian launch pad that has not been used for manned missions for almost three decades. Russia's Soyuz TMA-06M spacecraft, riding atop a Soyuz FG booster, blasted off from launch pad 6 at the Baikonur Cosmodrome's Site 31 in Kazakhstan at 6:51 a.m. EDT (1051 GMT). Flying under the call sign "Kazbek," Soyuz TMA-06M commander Oleg Novitskiy soared space-ward with Roscosmos cosmonaut Evgeny Tarelkin and NASA astronaut Kevin Ford. Destined for docking at the space station on Wednesday (Oct. 25), the three are set to join the orbiting laboratory's 33rd expedition crew. Novitskiy, Tarelkin and Ford will be met aboard the ISS by commander and NASA astronaut Sunita "Suni" Williams, cosmonaut Yuri Malenchenko and Akihiko "Aki" Hoshide, representing the Japan Aerospace Exploration Agency (JAXA). "Between now and the first of November, we have our launch, our docking, the release of the SpaceX Dragon, a Progress [Russian resupply vehicle] coming aboard, and a U.S. spacewalk, all in the course of the next week," Ford said in a preflight press conference. "We really face a lot of tasks that we'll concentrate on right off the bat when we get aboard." 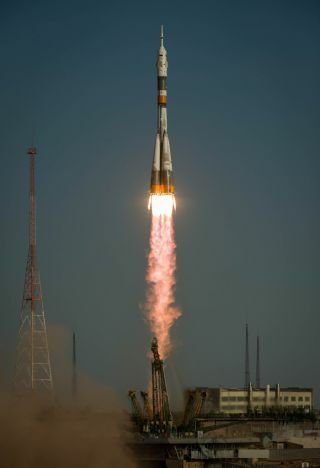 Soyuz TMA-06M is the first crewed spacecraft to launch from Site 31 since July 17, 1984, when the three-member Soyuz T-12 mission lifted off for the Soviet Union's Salyut 7 space station. Tuesday's launch was only the 15th manned spaceflight to begin from that pad, which was first used by the crew of Soyuz 3 in 1968. The site has given start to many more unmanned launches, including the first Progress resupply craft, as well as Venera and Luna probes sent to land on Venus and the moon. Soyuz TMA-06M was moved to Site 31 to test out recent upgrades to modernize the pad's infrastructure. Russia's more commonly used launch pad for crews, Pad 5 at Site 1 — also known as "Gagarin's Start" as it was used by the world's first space traveler, Yuri Gagarin, in 1961 — is set to undergo similar improvements beginning in 2014. "The pads do require some remodeling and modernization from time to time, so this is a planned change," Novitskiy told collectSPACE.com in an interview in July. "Before us, all the launches used to take place at the Gagarin launch pad and now we're going to switch that tradition and show that launches can occur from another pad at the Baikonur Cosmodrome. So we'll now use launch pad 31." Novitskiy said he was a bit disappointed not to be making his first spaceflight from the historic Gagarin's Start pad. "To be honest, I was slightly upset, but it happens pretty often that you're planning for one thing and your life throws you something completely different," he said. "Gagarin's pad really needs to be updated and prepared for its future launches and that is what is going to happen. It is great that we have several launch pads so that there were no interruptions between launches into space." Novitskiy's fellow first time flyer and cosmonaut crewmate had a different viewpoint. "I think it's interesting because it is something new," said Tarelkin in an interview collectSPACE.com. An aquatic crew of 32 medaka fish launched to the International Space Station on Oct. 23, 2012, alongside three new members of the outpost's Expedition 33 crew. The fish are part of an experiment to see how they adapt to microgravity. Novitskiy, Tarelkin and Ford were not the only 'creatures' to lift off from Site 31 on Tuesday. In addition to a stuffed toy hippopotamus chosen by Novitskiy's teenage daughter to serve as the mission's traditional talisman and 'zero-g indicator,' along for the ride were also 32 small, live fish. "They are Medaka [fish], maybe just a little bit larger than guppies," Ford said. "So all together we have 32 fish plus the three of us." The Japanese killifish fish are destined for an aquarium already set-up onboard the International Space Station as part of a JAXA study into osteoporosis. "When we come aboard, one of the first items will be to get these fish transferred and into their habitat and get this experiment underway," Ford said. "These fish have bone structures that are like mammals', so by looking at what changes in these fish in a zero-g environment they'll see how these osteoclasts and blasts, which are forming and destroying bone, change." "Really, it's about human research but it is being done with these Medaka fish," he told collectSPACE.com. Ford said that had he known the fish would be flying with him and his crewmates, he might have amended what he packed for the five month mission. "I meant to take along a hat that said, 'Gone Fishin' but I didn't," he said. "You have to pack a year in advance for spaceflight so I didn't get my 'Gone Fishin' hat up there, unfortunately."